ORANGE COUNTY, CA--(Marketwire - April 7, 2010) - Texting while driving (TWD) continues to be one of the most dangerous threats on our nation's freeways, yet at any given time, over 800,000 people are engaged in this practice. Despite high-profile campaigns to discourage the practice, including Oprah Winfrey's "No Phone Zone" pledge drive which has attracted and signed nearly 2,000,000 pledgers, TWD continues to cause untold damage on our nation's (and the world's) roadways. According to the National Health Transportation Safety Authority (NHTSA), distracted driving practices, including texting or reading emails while driving, accounted for approximately 6,000 deaths and 500,000 injuries in 2008 alone. Iconosys, Inc., a leader in the development of innovative mobile and stationary telecommunications applications and technologies, announced today the release of a life-saving solution to the deadly texting-while-driving social epidemic. Iconosys' easy-to-use SMS Replier application, available on the Google Android platform is an elegant and surprisingly simple, yet a powerful and versatile, mobile phone application that automatically responds to any incoming text messages or voice/telephone call while the user is driving. Versions for the BlackBerry, Palm OS, and Windows Mobile platforms are in development and, we believe, weeks away from release. iPhone release is dependent on Apple's next generation OS, 4.0, and is anticipated for early June. SMS Replier also takes advantage of the smart phone's built-in GPS functionality, and automatically knows when the user's vehicle is moving at a speed greater than 15 miles per hour. The application's GPS integration, when enabled, will automatically trigger a text message response whenever a call or text message arrives; at that time, callers receive an immediate text response using the default reply of "I'm Driving, I'll call or text you back as soon as I come to my destination." message. Users can also enter in their own customized response messages. In addition to the handy Texting-While-Driving integration that automatically tells the app when you're driving, users can also set their mobile phones on auto-respond for a predetermined period of time to accommodate other situations. If you're at the movies for example, you don't have to worry about missing a call -- just 1-click an auto-response that says, "I'm at the movies, I'll call/text you later." SMS Replier comes with up to 20 pre-set convenience messages that are useful in a variety of circumstances, allowing you to automatically select easy text responses such as "in class," "in meeting," or "busy." "SMS Replier™ eliminates the anxiety of not answering your mobile phone while driving, since you are reassured that the caller will be given your message of choice right away," said Wayne Irving, CEO of Iconosys and inventor of the SMSReplier™ application. "Technology always has a way of getting ahead of itself, and in the case of next-generation telephony and smartphones, the wonderful features and convenience it brings has not yet been matched with complimentary (but vitally important and necessary) safety features. I developed SMSReplier™ to fill this gap, and to provide an environment in which drivers can safely take advantage of their smartphone technology without being distracted." Mr. Irving has a long history of developing next-generation concepts, including securing the first working prototype and digital rights for interactive television for the Academy Awards television program, developed in 1998. The SMS Replier™ application works by enhancing the existing SMS network, and joining it with new services that are now available on the most popular smart phone platforms, such as real time traffic, mapping, and GPS. Also, in the late 1990s, Mr. Irving was one of a handful of CEOs that led the way in creating the downloadable music and movies markets that we take for granted today. 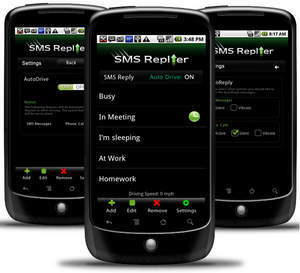 SMS Replier™ is available for a limited time as an advertisement-supported free version. In the near future, SMSReplier™ will cost $9.99 per download, and SMSReplier will be available for download at www.smsreplier.com or www.smsreplier.mobi. About this company Iconosys, Inc.